Wriggle, warp, and roll your way from one clip to the next with TranStatic from Pixel Film Studios. With 50 professional static transitions for Final Cut Pro X, you can create endless thrilling, hip, or horrifying looks. Easily add realistic static transitions to your footage by dropping one of TranStatic’s effects between two of your clip and adjust the length to your liking. 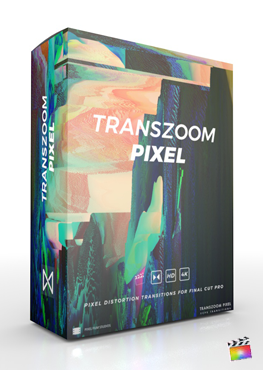 Quickly and easily make your footage look like its being taken over by a stronger incoming transmission with TranStatic from Pixel Film Studios. This collection of 50 static transitions comes equipped with every lined, pixely, grainy static you can think of for Final Cut Pro X. After studying many contemporary espionage and horror films, the team at Pixel Film Studios was able to design the most realistic and dynamic static transitions available. Whether you are making your own spy film or thrilling trailer, TranStatic can help set the tone of your film while creating a stylistic theme. TranStatic does not simply add static to your footage; it makes static out of your footage. Apply one of TranStatic’s transitions between your clips and see your images wriggles, warp, and roll together and then flicker and crackle apart to reveal the new image. TranStatic was designed to work seamlessly inside Final Cut Pro X, eliminating the need to composite footage. Simply choose your static effect in the transitions window, and then adjust the length you want the transition to last to work best with your scene. Where do I find TranStatic: Volume 1? Once the installation is complete, you can find TranStatic: Volume 1 in the FCPX Transition library.